The early modern German county of Lippe was a parcel of territory that was located between the River Weser and the south-eastern section of the Teutobergerwald. The House of Lippe resided along the river of the same name, originating in the person of Count Jobst Hermann of Lippe. He died around 1056, but his grandson (or great-grandson, born around 1090), Bernard, succeeded him. In 1123, he was granted a parcel of territory by Holy Roman Emperor Lothar II of Supplinburg and, as the new, and first, 'Lord of Lippe', Bernhard became Bernhard I. With the death of Count Simon VI in 1613, Lippe was divided in four: Lippe-Detmold (held by the senior line of descent under Simon VII), Lippe-Brake (passed to the next oldest son, Otto), Lippe-Schwalenberg (held by the next in line, Hermann, who is included alongside the counts of Lippe-Detmold), and Lippe-Alverdissen (held by the youngest, Philip I). Each division retained the status of a county, although the secondary divisions rarely held any territory of note other than the odd castle or town. 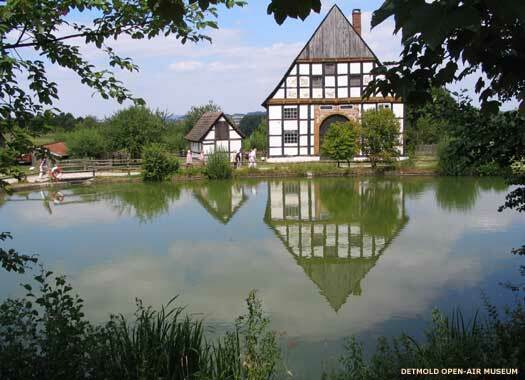 Lippe-Schwalenberg was reunited with Lippe-Detmold, presumably upon the untimely death of Hermann in 1620. Four years later, in 1624, Count Simon VII passed a large dairy farm onto the bailiff of Schwalenberg (one that had been created out of several failing farms by Simon VI in the early years of the century). This was later sold to Simon's widow, Maria Magdalena, and her youngest son, Jobst Hermann, built the manor of Biesterfeld there, creating the subsidiary line of Lippe-Biesterfeld. In its initial phase, this was more commonly known as Sternberg-Schwalenberg until 1736, when it was partitioned between Lippe-Biesterfeld (the remnants of Sternberg-Schwalenberg) and Lippe Weissenfeld. Despite this, Jobst Herman himself is often named as the first lord of Lippe-Biesterfeld, thanks to his founding of Biesterfeld Manor, even though his immediate descendants are not linked to the Lippe-Biesterfeld name at all. First lord of Lippe-Sternberg-Schwalenberg for Lippe-Detmold. The Thirty Years' War in central Europe sees a series of destructive conflicts take place. Originally this is as a result of the Reformation and its Papal response, the Counter Reformation, but later it also serves as a continuation of the Bourbon-Habsburg struggle for supremacy. Count Simon VIII of Lippe-Detmold does his best to keep Lippe neutral so that it might be spared as much as possible, but it suffers nevertheless when imperial troops are billeted within its borders. When Count Simon VII of Lippe-Detmold dies, his son, the youthful Simon Louis, succeeds him. As he is not yet of age, a regent is selected for him in the form of Count Christian of Waldeck, his step-grandfather. The most likely contender for the role is Otto of Lippe-Brake, but he cannot be selected due to the ongoing strained relationship between Detmold and Brake. Simon Louis' maternal uncle, John Louis of Nassau-Hadamar, is not asked as he is a Catholic. Count Simon Louis of Lippe-Detmold has gradually been moving away from the neutral pose adopted by his father. After courting the powerful Swedes, Lippe suffers from the presence of their troops in the region as part of the First Polish-Swedish War and their ongoing territorial conflicts with the Holy Roman empire in Pomerania. Schwalenberg Castle is attacked and looted in 1634, and Varenholz Castle suffers the same fate in 1636. Brother. Last lord of Sternberg-Schwalenberg. Holy Roman Emperor Charles VI offers to raise Count Simon Henry of Lippe-Detmold to the rank of imperial prince for the reasonable figure of 4,400 talers. Unfortunately, not only can Simon Henry not raise the money, his finances are so fragile that he is forced to sell off two lordships in the Netherlands in 1725, those of Amiede and Vianen, and pledge Sternberg Castle to Brunswick-Lüneburg in 1733. Opinion is divided on whether this financial trouble is due to alleged profligacy by the count or hardships inflicted by the Thirty Years' War that the count copes with admirably by raising money where and when he can. Sternberg-Schwalenberg is divided, with probably the majority of its territory going to form Lippe-Biesterfeld (which may already exist as it is sometimes applied to Jobst Herman). The remainder is used in 1762 to form Lippe-Weissenfeld. The descendants of Rudolf Ferdinand are known as the lords of Lippe-Biesterfeld. Son. First lord of Lippe-Biesterfeld. Raised to count in 1762. Frederick Charles August is sometimes acclaimed as the last lord of Sternberg-Schwalenberg. In fact, this title had ended with the death of his father, Rudolf Ferdinand, in 1736. Between then and 1762, Sternberg-Schwalenberg was divided between the newly formed Lippe-Biesterfeld (in 1736) and the equally new Lippe-Weissenfeld (in 1762). At the same time, the lordship of Lippe-Biesterfeld was elevated to the rank of count. During the tenure of Frederick Charles, he moved the manor's brewery moved from Schwalenberg to Biesterfeld and added a distillery to it, investing heavily to ensure the project's success. In 1763, possibly in celebration of his elevation to count, he built a hunting lodge which was named Friedrichsruh (later demolished, in 1859, to make way for a guest house). The chancellor of the German empire, Otto von Bismarck, purchased Friedrichsruh and attached it to his manor of Sachsenwald. The guest house was rebuilt as a castle which maintained the name of the hunting lodge in the form of Friedrichsruh Castle. Formerly the lord of Lippe-Biesterfeld. The counts of Lippe-Detmold are raised to the rank of 'Prince of the Empire', the title for the head of noble families rather than the offspring of monarchs. Despite already being the senior line of descent for the House of Lippe, it is clearly now superior to the other branches of the family, and so the designation of Detmold is dropped from the title. The town of Detmold itself remains the capital of the new principality. Lippe sends a battalion of infantry and a battalion of landwehr (militia) along with three companies of the Detmold Landwehr and the Schaumberg-Lippe Battalion to join the allied forces that array themselves against France during the Hundred Days. The units are attached to the Anhalt-Thuringian Infantry Brigade, part of the Army of North Germany under the command of General Kleist von Nollendorf. As a result of the subsequent Congress of Vienna, Lippe becomes a member of the German Confederation. Prussia fights the Austro-Prussian War against Austria, essentially as a decider to see which of the two powers will be dominant in central Europe. Austria and its southern German allies are crushed in just seven weeks (giving the conflict its alternative title of the Seven Weeks' War), and Prussia is now unquestionably dominant. 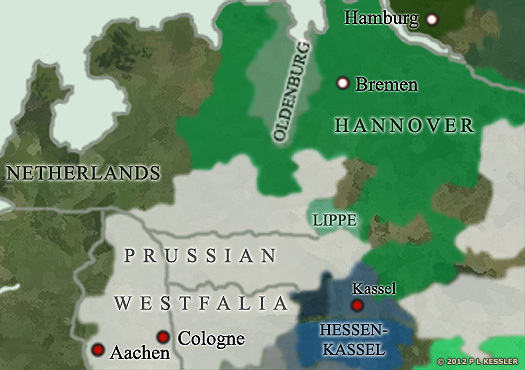 Bismark oversees the seizure of four of Austria's northern German allies, and the new, Prussian-dominated North German Confederation gains members in Lippe and Schaumberg-Lippe Bückeburg, among many others. Son. Regent of Lippe (1897). With Prince Alexander of Lippe remaining childless, his eventual death as the senior member of the House of Lippe means that the Lippe-Detmold branch of the family will become extinct. The future Count Leopold of Lippe-Biesterfeld is due to succeed as prince and the head of the house, and is also in line to gain the first physical territory for his branch of the family, but the neighbouring principality of Schaumburg-Lippe disputes the assumed succession. As Schaumburg-Lippe is junior not only to the Lippe-Biesterfeld line, but also the Lippe-Weissenfeld line, a ruling goes in favour of Ernest of Lippe-Biesterfeld. Adolphus of Schaumburg-Lippe steps down as regent in favour of the victorious Ernest. Son. Regent of Lippe (1904). Succeeded as prince of Lippe (1905). The imperial court is forced to rule on the decision of 1897 that had upheld the claim by Count Ernest to be the rightful successor to Prince Alexander of Lippe. As Alexander is the last of the Lippe-Detmold line, and the only other claimant, Count to-be Adolphus of Schaumburg-Lippe, is a junior member of the Lippe princely house, Ernest's claim is upheld. As Ernest's successor, Leopold becomes Leopold IV of the principality of Lippe, and all further details for him and his successors as princes of Lippe and counts of Lippe-Biesterfeld are listed there.